Foreigner’s Tribunal Tinsukia Recruitment 2018 : We are back with yet another Foreigners Tribunal recruitment in Assam. Earlier we have informed about foreigners tribunal Dhubri Jobs . This time Tinsukia District Jobs in Assam for foreigners tribunal recruitment is out. 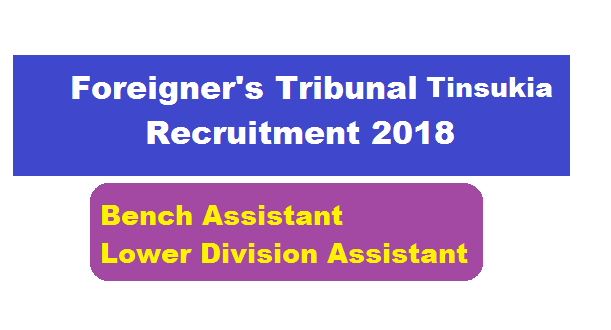 According to the latest Foreigners Tribunal Recruitment 2018 for Tinsukia Application are hereby invited from the intending candidate for filling up of the following Sanctioned Posts of Bench Assistant and Lower Division Assistant (both are Scale Pay) Office of the Foreigners’ Tribunal, Tinsukia, Borguri Court Tiniali, District: Tinsukia-786126, State-Assam. In this section, we will discus in detail about Recruitment of Bench Assistant and Lower Division Assistant Posts Under Foreigner’s Tribunal Tinsukia Recruitment 2018 with all the details and requirements . Following are the details of the post under Foreigners Tribunal Recruitment 2018 for Tinsukia District. 1. The Candidate having minimum qualification of higher secondary School Leaving Certificate. 2. One year Diploma in Computer Application from Govt/Govt. Registered Institue. Application should be submitted in the Standard Form as published in Assam Gazette in PartIX and reach the office on or before the day of 16th July, 2018 upto. 5.00 PM. a) Self attested copies of certificate/diploma etc. in support of the Education Qualification must be accompained with the application. b) 3 (three) copies of recent passport size photograph duly attested by a Gazetted officer must be enclosed with the application. The name of the candidates must be written on the reverse of photograph. c) 1 (one) self addressed envelope of 5 cm x 11 cm size affixing postal stamp of Rs. 10/-only must be enclosed. d) Name of the post applied for must be written on the top of the envelope. e) Mobile number of the candidates must be written on the top of the application. 1/ Incomplete applications and application received after last date will not be accepted. 2/ Postal delay in delivery of calling letter, the undersigned will not be held responsible. 3/ No application will be accepted after the last date of submission of application. 4/ Calling letters will be dispatched by post.